I figured this being our 20th Beer Brawl™, we should step it up a notch, being an anniversary of sorts. This week, with that in mind, we took the Beer Brawl™ on the road to Amanti Vino in Montclair NJ. Amanti Vino specializes in selling Artisinal Wine and Craft Beer. Having attended several events at Amanti Vino, I knew they had a nice space to record in. The Beer Manager, Travis Glohs is a huge beer lover and was excited to help us out, what we ended up with is the Barleywine Beer Brawl™. 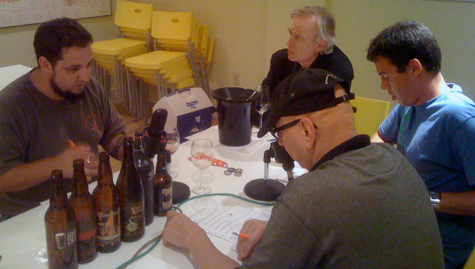 With me on this podcast was Mark Jackson, Corey Greenburg, and Travis Glohs from Amanti Vino. The only prerequisite I have for these Beer Brawls is a love of beer. 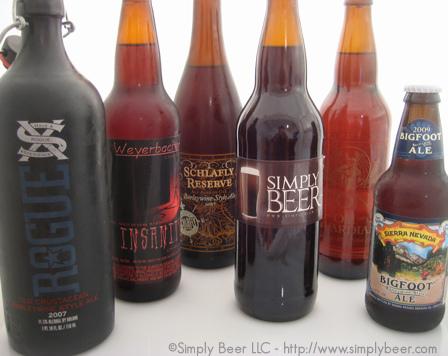 You don’t need to know anything about the beers we are drinking only a willingness to try them and voice an opinion. We started off the night with the Bigfoot Barleywine, but in retrospect this beer probably should have been shelved for another couple of years. Next up after that 09 bigfoot was the Simply Beer homebrewed clone of a Bigfoot barleywine, bottled in 2007. big huge head on a nutty chocolaty beer. Barely made the style but a very drinkable beer. Probably the guys were being overly nice, cause it was my beer, but it was very well received. The 2007 oak aged Schlafly Barleywine was next. After their 2007 Imperial Stout, I had high hopes for this beer and it didn’t disappoint. The oak and vanilla imparted onto the beer really took it to another level. Hoping to get something good from Stone, increasing our 2 good beer streak to 3. What we got was another young beer. Not saying it was bad, but will be much better in a year or two. Tons of hops and a strong alcohol taste that needs to mellow out. The last beer of the evening was the Weyerbacher Twelve. This was their twelfth anniversary ale a “Barleywine” with 50% rye. As you can see by me putting Barleywine in quotes, classifying this as a Barleywine just didn’t work for me. Great beer if you don’t know what you are drinking, but it tasted nothing remotely close to a barleywine. Inspired by last weeks Allagash tasting, Beer Brawl™ 21 will be an assortment of Allagash beers.